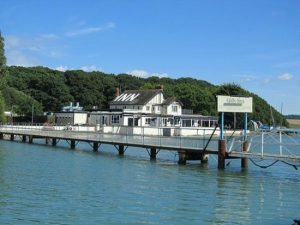 We often get asked for restaurant recommendations in the Wootton and East Cowes area. We love good food, fresh ingredients, and a good ambience. 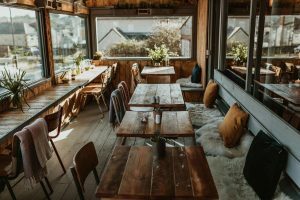 So these are our favourite restaurants, all well priced too ! And all within about a 5 min drive of us at Into the Woods. CIBO, High Street, Wootton – 01983 883469 Fab new Mediterranean Café, Eatery & Bar located in Wootton High Street. Serving rustic breakfast, artisan sandwiches, pasta, risotto & salads with delicious vegan and vegetarian options. Local produce, laid back atmosphere & friendly service and super cool vibe – we love it ! 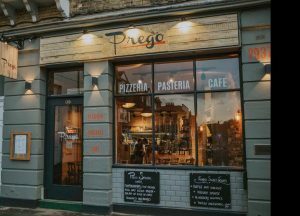 PREGO, East Cowes – 01983 293737 New contemporary italian restaurant, offering handmade pizza, pasta, paninis and salads all made with authentic Italian ingredients and fresh IoW produce , with vibrant and friendly service. Or just pop in for some great Barista coffee or enjoy a glass of vino from a hand selected list of popular, drinkable wines. Free Take Out delivery in East Cowes and Whippingham too ! The FOLLY INN, Whippingham – 01983 297171 A large family pub in a picturesque setting right on the river. With a historical nautical interior, and good pub food an friendly service, it’s a good easy option, with the added bonus of a lovely walk along the riverbank afterwards. BLUEBELLS at Briddlesford Farm – 01983 882885 Cafe/ restaurant alongside the local farm shop. Imaginative good food using their own and local produce. Open for breakfast and lunch and some evenings. The farmshop next door is perfect for stocking up on amazing IoW veg, their own butchers counter, their own lovely pies , cheeses , milk etc, fresh bread, plus locally brewed alcohol, eco products, farm / country souvenirs, cakes, biscuits, condiments etc etc!